The Statue of Liberty is perhaps the most well known sculptures in the world and a famous landmark, a gift from the French to the Americans to represent freedom and welcome refugees entering the United States. The statue depicts a robed female figure hoisting a torch above her head supposed to represent the Roman goddess Libertas. This is the look we’re going to try and recreate. In today’s post we’ll be showing you how to put together your own Statue of Liberty costume for both children and adults, for fancy dress as well as Halloween. With information on how to make it yourself from scratch and premade options for those stuck on time. This will make the perfect costume choice for those who want to go as something that is well known but that other people won’t be dressed as, nothing worse than going to a Halloween party and a dozen other party-goers are dressed the same! So without further ado let’s get into the guide. The first thing you’ll need is a headpiece, you can buy one from the link above or if you’re going the do it yourself route you can create a headpiece yourself using a piece of sturdy blue foam cut to shape to accommodate your head size/shape. Then you’ll need a torch such as the one above that is made of one hundred percent polyester and comes in at four inches tall. Now let’s move onto the outfit itself. There are several outfit choices for women, this first from Rubies includes a dress and headpiece. Then the Lady Liberty outfit set includes: dress with drapes, headpiece and torch. The set you pick will depend on what type of style you want. For those going the do it yourself route you can create this dress with a piece of plain light blue fabric. Always have a backup just in case one retailer goes out of stock. Here is an alternative to the Lady Liberty outfit from Haloweencostumes.com which includes: dress with drapes, headpiece and torch. There is also another version for plus sized women. 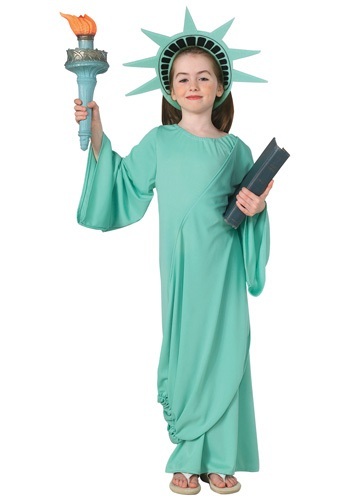 People of all ages can dress up as the statue of liberty with this costume for children that comes with the blue dress with drape, and included headpiece. 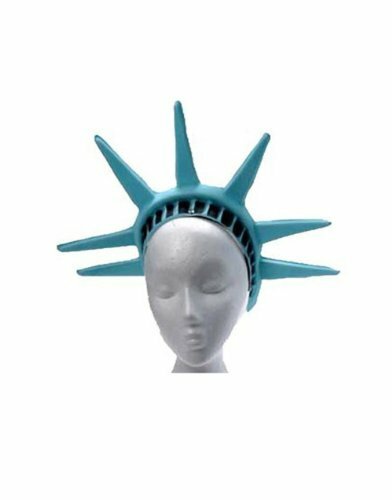 That is everything you’ll need to transform into the Statue of Liberty for fancy dress and Halloween parties (or even for dress up around the house). Don’t forget we have other tutorials on the blog you can check out, also follow us on social media for updates whenever we publish new posts.